Dragon 1/35 OH-6 "Egg" WIP, 03/22/09, "FINISHED"
Before I begin, I beg forgiveness to all of the helicopter regulars as an armor modeler drops in. 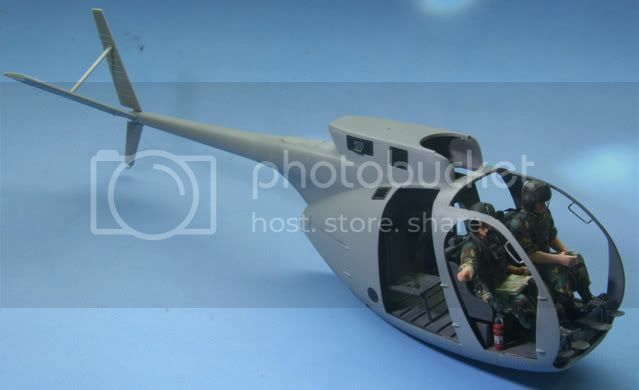 After years of service in Air Assault and Artillery, I thought my first try at a heilo would be the OH-6 or Loach or Egg, whatever you prefer. 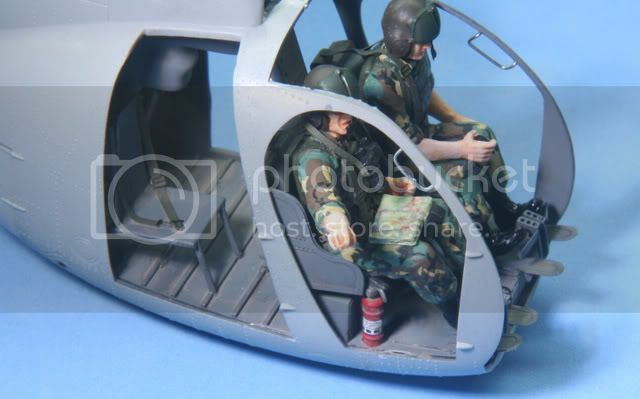 I will finish the OH-6 in a mid 80s look on an aerial artillery observation mission. 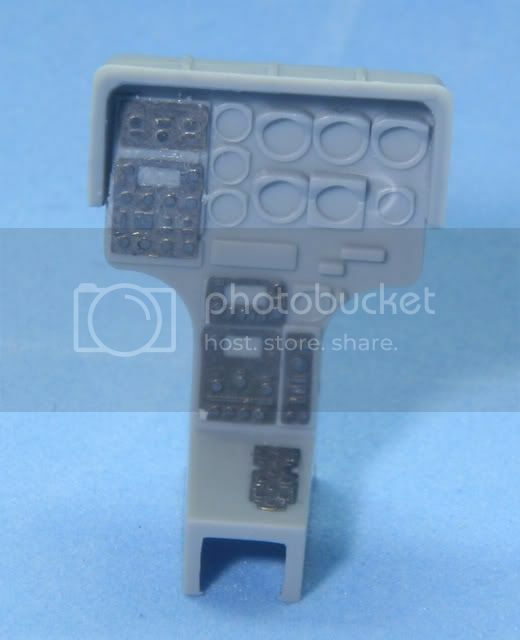 Besides the kit itself I will be working with the Eduard PE set and some resin cast extras for the cockpit, plus the usual sods & ends scratch details. 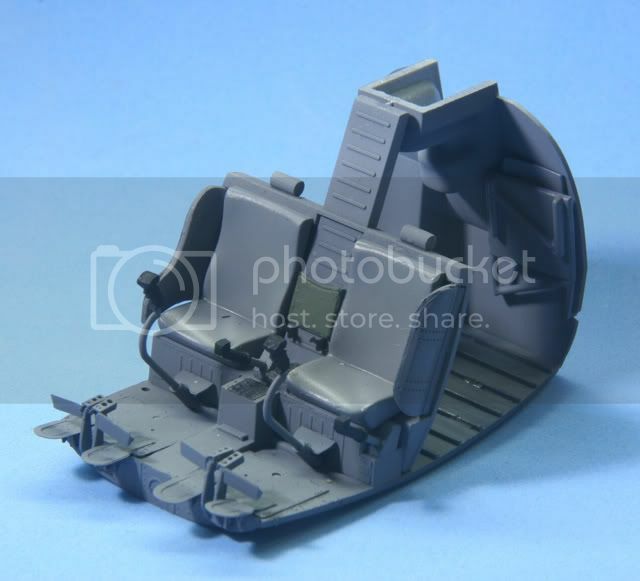 Here is the cockpit generally assembled from the first two steps of the instructions along with Eduard PE added. 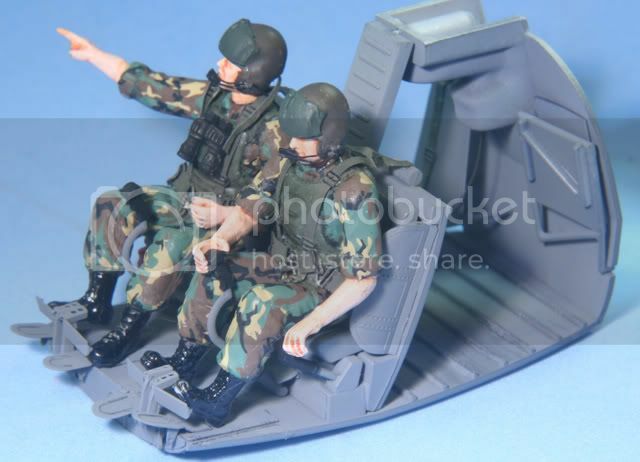 In general the fit was good but had to fill some part holes in the rear cabin as I will not be using the mini gun. 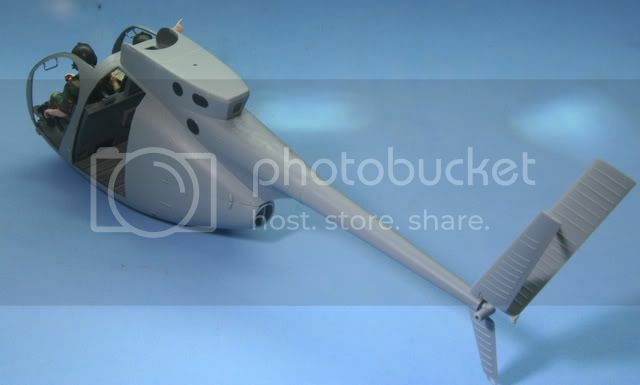 After assembly, the cockpit was given a primer of Tamiya Black and then a coat of Tamiya Gull Grey (XF54). The control stick was painted with Tamiya Black and the document holder with Vallejo Dark Green. I have begun the assembly of the figures. 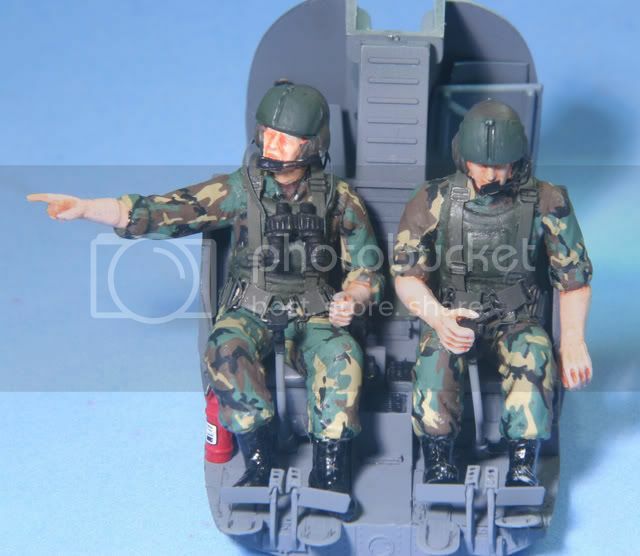 The kit only included the pilot and gunner and had to swap the gunner with the co-pilot/observer from the Dragon figure kit. I have worked the figures from the bottom up and the uniforms will be the BDU style using Shinsengumi decals. The figures were first painted with Vallejo Dark Green, except the boots, which were painted Black. They were then coated with future to allow the decals to set down. The picture shows the pants completed with the decals. That's where I am at for now. All comments are welcome, thanks for looking. 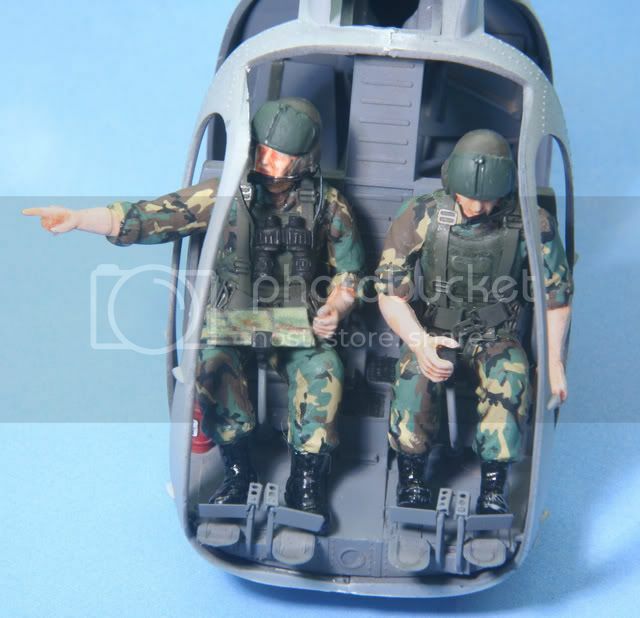 Gino's a pretty darn good helo modeler so I don't judge folks by their avatars. Your Loach is looking mighty fine. I have seen several of these started lately. Can't wait to see what you do with her. Would you happen to have a pic of the bird yo are building since it's not going to be Miss Clawd IV? I always like to see the real machines. Rotowash - Thanks for looking in and the vote of confidence. My younger "redleg" brother Gino can turn out one hell of a heilo. With this being my first venture into the roto world....I trying not to auto rotate!! Sadly, the bird I am thinking of, I can't find any of my pictures . If I find them....they will be up here. Thanks again, look forward to some new friends on this side of the forums and some good comments. It's god to get your head clear of road wheels and tracks once in a while! I may be headd for foreign territory soon myslef! Are you doing this as a Viet Nam era chopper? I didn't know they wore camo outfits in the Nam? A very nice start. I just got my hands on the same kit and hope to build it soon. Of all the aircraft I've flown the OH-6 has always been a favorite. It was the corvette of the helicopter fleet. Look forward to following your build. Retired Gunpilot - Like a car that feels the road the Loach could feel the sky. It was always a blast to fly in the Egg. Looking forward to it, Redleg! "I lay like a small idea in a vacant mind" - Wm. Least Heat Moon "I am at the center of the earth." - Black Elk My FSM friends are the best. 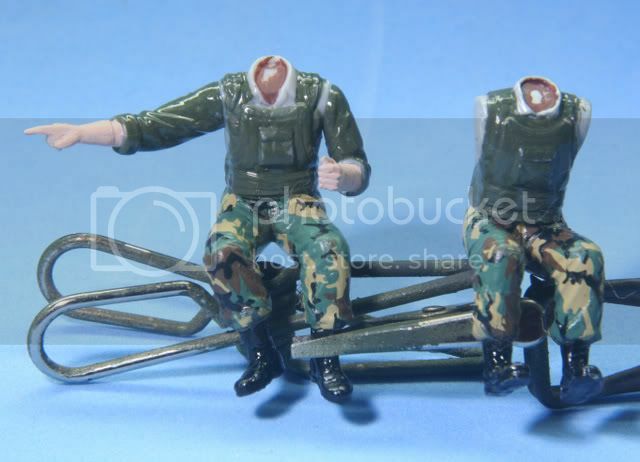 I didn't know they wore camo outfits in the Nam? Early on in the war the guys (before tigerstripes) would wad up their issue fatigues and spray black paint on them to create makeshift camo. The pattern you see here (later in the war) was "Vietnam Leaf". Special ops would wear "Tigerstripes" (although it wasn't officially sanction by the US military). Looking good Mike. The Edauard PE spruces it up nicely. I'm waiting to see how it comes out. Thanks for the compliments on my helos too guys. M60 - Thanks for stopping in. Disastermaster - The pattern on the figs is BDU camo from the 1980s. It is different than either of the VN camo patterns. Thanks for stopping by! Heavy - Thanks, the PE is great on this kit, especially for the controls which are very plain on the kit. As I said else where: Looks good so far! 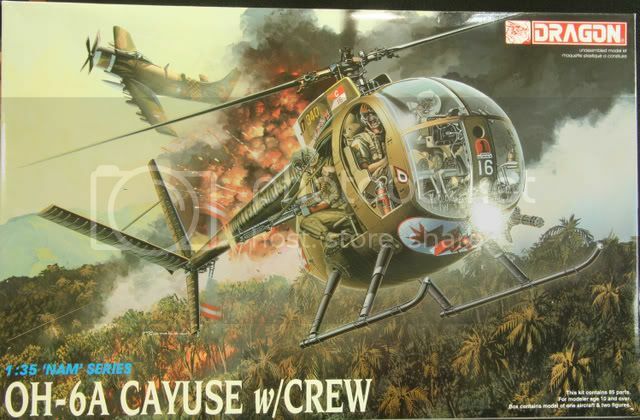 What is it that artillery guys start building helos? It has been a few weeks since my last update and with the combination of short bench time and working on the figures, it has taken a while to give you some news. Figures were done with Shinsengumi BDU decals, Vallejo Dark Green for the vests, boots were painted Tamiya Black, the helmet uses Model Master OD for the helmet and Tamiya IJA Green for the visor section. The knob on the visor and slide section in the center of the visor cover, were coated using a graphite pencil to give that dull worn metal look. The boom microphone was made from 28 gauge stainless wire and a small piece of painters tape for the microphone. Then it was painted Tamiya Flat Black. Also coming off the helmet is the connection wire which was also made from 28 gauge Stainless wire. The face, arms and hands were done with Vallejo Flesh tones and then washed with a mixture of flesh and burnt sienna oils. The entire figure was coated with clear flat to give the final finish. The binoculars used Tamiya Flat Black and the strap is painters tape coated with Model Masters OD. The binoculars are worn using a graphite pencil. The observer was missing one thing....a map....so I scanned and scaled one of my military maps, folded it and my observer was complete. After the figures I weathered the cockpit with MIG City Dust and a graphite pencil for wear on the ribs. Before gluing the cockpit into the body halves, I mounded some 26 gauge stainless wire to create the grab handles on either side of the front door. I then applied details to the hatches and access ports using Archer Transfers . I assembled the engine covers and exhaust port which fit fairly well but will need some filling. And lastly, the tail boon was assembled and mounted. That's it for this installment. Next is the control panel and wiring details along with the canopy and details. Wow! Nice progress. Keep up the great work. I can't wait to see the next installment. Well hopefully your going to paint the observers gloves since flesh color flight gloves don't suit him. Mikeym - Its July.....2 in the afternoon....sunny.....I'm not waring gloves!! The Dragon figures are modled bare handed. for at least the pilot it would have been nice to have gloves. In truth, the times in my past when I did aerial observation, I never like the gloves. Handling the map, papers and bionos with gloves just did not work for me. Thanks for the thought....I did not overlook it.....Dragon did!! Though they do save you from handling hot metal in a helo that had been sitting in the heat and the sun for several hours. Could paint on gloves but may look strange.....thats why I stayed with flesh. figured it was the better of two evils!!! If I remember in the 80's weren't the Nomex gloves still Sage green overal with gray palms? I love it. She is looking excellent. My only comment is I would have painted the pilot in the old two-piece nomex colors. I'm not sure that even the guard had the 6's when the camouflage flight suits enter service. I believe the two-piece and the single gray nomex were all that was available during the last years of the the 6. As to the gloves you cold have applied some Mr. Surfacer 500 or 1000 to the pilots hands and arms and then colored the area green and gray or just pure gray to give the appearance of gloves. I had all leather gray gloves that I wore long after they quit issuing them. I liked the all leather over the nomex/leather mix. Anyhow, she is looking great. Gunpilot - Good thought with the Mr. Surfacer, didn't think of that one. Now I will have to ponder if and how I make a fix!!! As for the egg and its use. yep it was off active duty by the late 70s but was in service with the guard and reserve into the 90s. That is interesting, I thought they were retired from the guard by the mid-eighties. I learn something new every day. As to the pilots uniform though I did not think they had camouflage flight suits until the late nineties with the exception being a few test and trail suits. Anyway that is small stuff, your bird is looking really nice and can't wait to see her finished. Glad I am "subscribed" to this thread, Mike! I eagerly await more! Bill and M60 - Thanks for stopping in and for your comments. "I'll be back!!!!!" Charlie - HOLY ?%^&.....long time no hear. Thanks for stopping in. I will drop you a PM later. WIah I could help you with the gloves/camo info, but I haven't a clue! I just know what I like, and I like what I see! The figures look outstanding, IMO! Karl - Thanks on the figs. Coming from someone like you and knowing the figs in your builds, it truly is nice to hear. Tread - Thanks for stopping in. Yep the camo uniform is decals. I feel like a 1/35 tailor! !